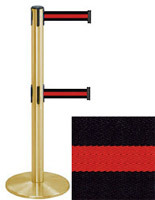 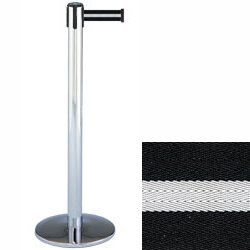 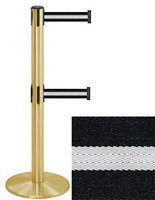 Crowd Control Stanchion- This post has a polished chrome finish with a 7 1/2 foot black retractable belt with white stripe. 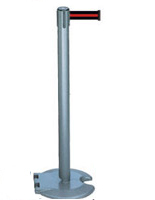 This line control system is perfect for controlling and directing traffic in lobbies, waiting areas, airports, food lines, registration offices. Posts are easily mobile allowing for easy environmental changes. 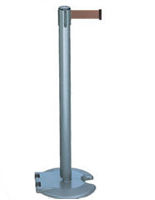 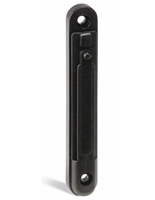 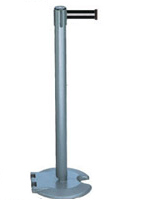 The line control post measures 38" tall, 13 1/2" diameter base, and weighs 24 lbs, the belt is approximately 2" wide.